Imagine a typical 9000 gallon gasoline tanker engulfed in flames. If you can’t generate that image, click here for an actual video of that particular form of devastation. Now imagine you live in a house less than 1000 feet from where a truck just like the one in the video is parked every night. Imagine you have young children sleeping in the next bedroom. It’s not a very comforting mental image, is it? Well, unfortunately, this exact situation exists right here in Warren. Tiffany Drive and Nocturne Street are located just behind the Valley View Petroleum offices at 1860 Elm Road. Most evenings, after about 7:00 p.m., you can find the truck pictured here, parked behind their offices, in an unfenced, unguarded lot. Any looney with a Zippo could walk right up to this rig and do whatever comes to mind. I first heard about this situation from Howland Police Chief Paul Monroe, who told the members of the Northeast Neighborhood Association in Warren about it last April. Chief Monroe told us that the Howland Police had repeatedly cited the truck for being illegally and unsafely parked at the Valley View store at Elm and Reeves Road, which is in Howland. 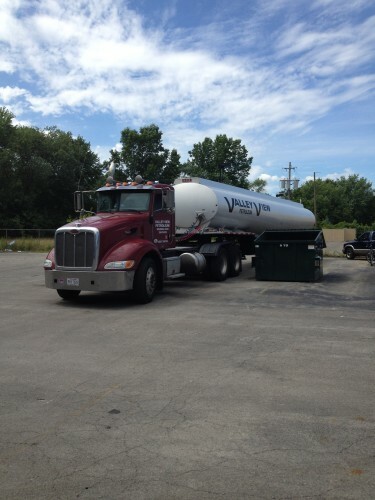 Subsequently, they moved the tanker to their nearby office parking lot in Warren. From here the story gets a little murky. There is evidence to suggest that the Warren Fire Department soon began citing the company as well, but for some reason the truck is still being parked there four months later. Why? 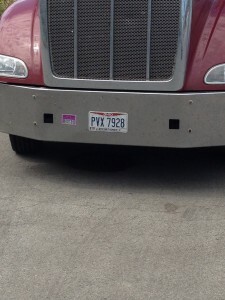 I became curious while out canvassing on Nocturne and Tiffany last Sunday, and several residents mentioned that they have been wondering about the safety of parking the truck there. So Monday morning I called the WFD Chief and asked for copies of any citations written against this location this year. He promised to get back to me. He didn’t, so I called again Tuesday afternoon but he was out. This morning (day 3) I went to the Central Station and was again told that the Chief was out, but that I could talk to an Assistant Chief. I made my request again, and the AC called the Chief, who told him to call the Director of Public Safety and Service, Enzo Cantalamessa, who said my request was being reviewed by the Law Director, and that they would get back to me. An hour later I saw the Law Director at an event and asked him if I could expect my documents this afternoon. He told me that there are no “citations” at that address to give me. I went home and created a written request for copies of any “notices of violation” and/or “inspection records” written by the WFD, which I hand delivered to the Chief at a little after 1:00 p.m. today. The Chief went into his office and made a telephone call. When he returned he again told me that Mr. Cantalamessa told him that he should not fulfill my request until it has been reviewed by Law Director Hicks. I know this is a long story. Why does it matter? Well, there is the obvious safety issue of having 9000 gallons of gasoline stored in a residential neighborhood — that’s number one. Then there is the question of why this situation has continued for four months. Have there been inspections during that time and what did they say? Finally, why are they withholding access to public documents? I discussed the situation with an attorney who is very familiar with this aspect of Ohio law, and he told me that the stalling and lack of response over the past three days is clearly illegal. Why is Enzo, who is an attorney, ordering the Fire Chief to break the law? Requests for access to public documents, which these are, do not need to be made in writing. The person making them does not need to identify himself or give a reason for the request, and the courts have generally stated that they must be responded to promptly — typically within minutes when a request is made in person, as my last one was this afternoon. Posted Wednesday, August 26th, 2015 under Crime.